Bob and I made a stay in Huntsville, Ontario, at the end of July, and having driven for 3 hours to get to our accommodation, as if we needed an excuse, we headed off almost immediately to stretch our legs, another deception as we are always on the lookout for whatever wildlife might cross our paths and hardly ever leave our cameras behind. 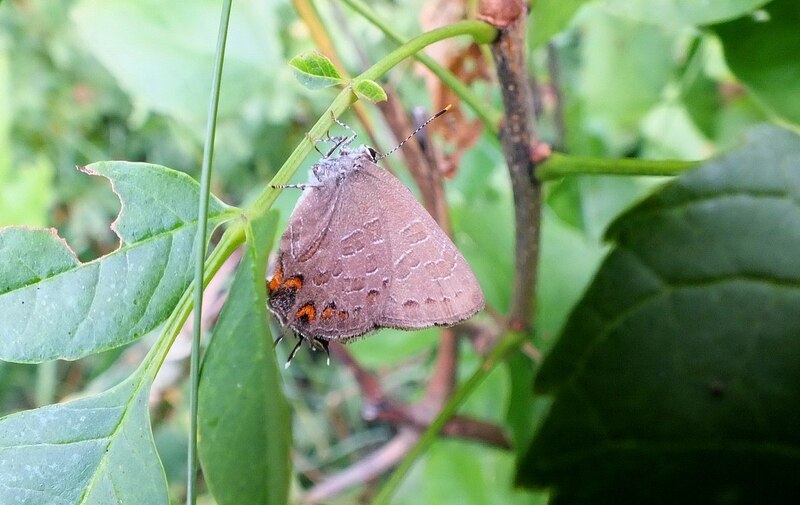 Once again, it was Bob’s keen eye that noticed the fluttering of a Striped Hairstreak Butterfly on a plant and had him exclaiming, “there’s a new butterfly!”. 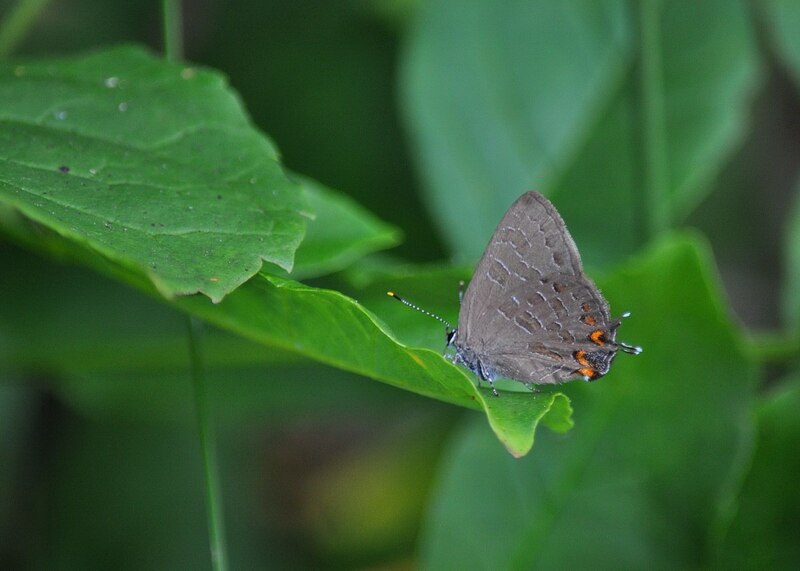 I was not as quick to pick out the Striped Hairstreak Butterfly because I didn’t really know what I was looking for. This was a Lifer for us, and the butterfly was tiny with a wingspan of only about 1 1/2 inches (4 cm). It was the two tails on the hindwings that helped us identify the Hairstreak, with one being shorter than the other, as well as the orange cap on the blue spot on the ventral side of each hindwing. I thought it odd that the butterfly was perched as it was at the edge of a sunny meadow in fairly deep shade, and that it seemed to favour foliage over flowers. It flitted between several low bushy plants and maintained a distance of about 2 feet between itself and the ground. 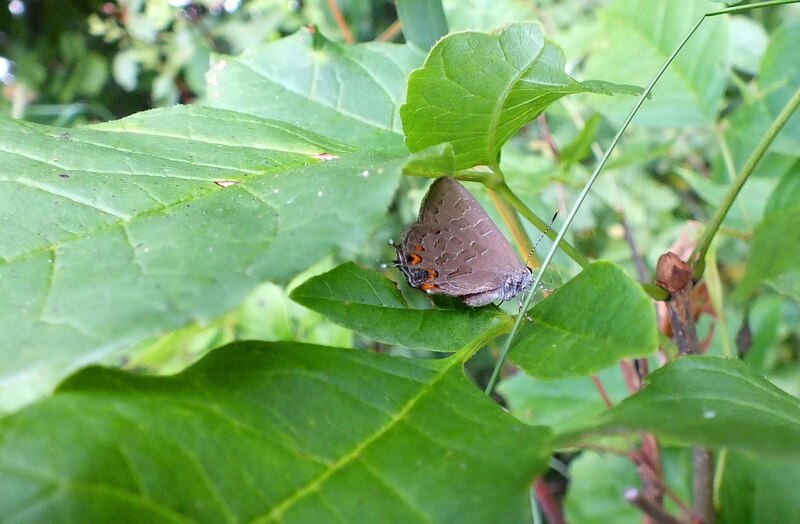 Then I learned that this is typical behaviour of a male Striped Hairstreak Butterfly that is watching and waiting for a female, or it could be a female about to lay eggs on the end of the twigs. 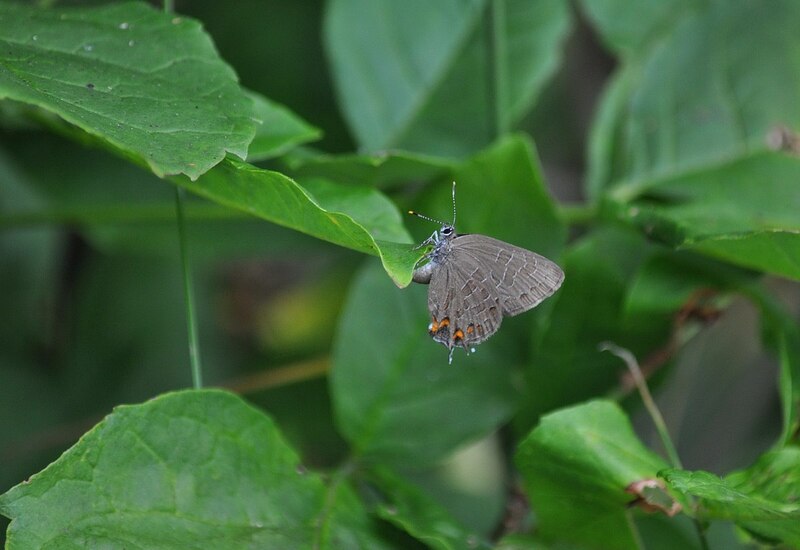 Adult Striped Hairstreak Butterflies are only on the wing once a year, and in the north, that is between July and August. During this one flight period, the males actively seek females, and the eggs that she subsequently lays will not hatch until the following spring. To keep nourished, adult Striped Hairstreaks will feed on nectar from a good assortment of wildflowers including goldenrod, common milkweed, white sweet clover and staghorn sumac, all of which are abundant throughout their habitat. Other sources of nectar for this species are plants less familiar to me including chinquapin, dogbane and New Jersey Tea. 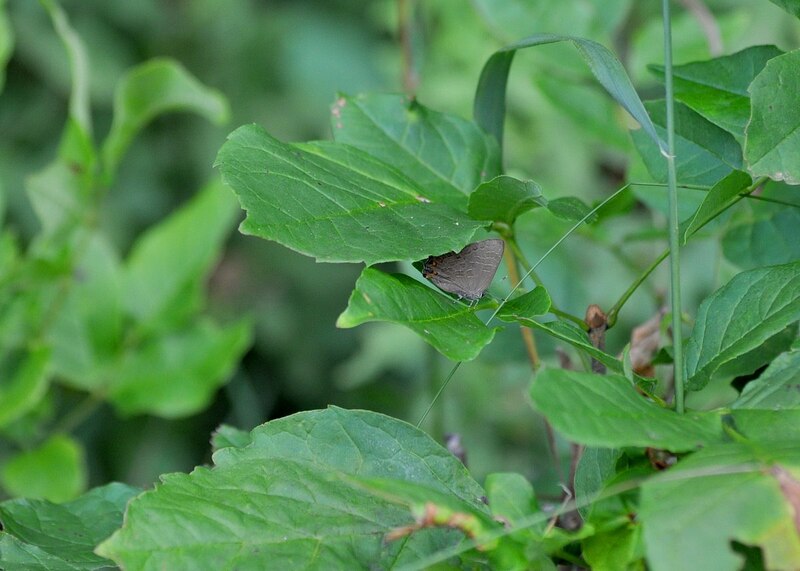 The location where we found this Striped Hairstreak Butterfly meets the requirements of this species because the sunny meadow that spread up the side of the large hill was bordered on three sides by a deciduous woodlot. Even at that, it would have been atypical to find more than one individual in that single location as these butterflies are uncommon and not numerous. As each larva emerges in the spring, it will feed on all parts of its host plant, which in all likelihood would be either plum, cherry or hawthorn, and when they mature into butterflies, at least for a short time, there might be several dancing across the field.